The Warhawk is powered by a massive 340 XL Engine that gave it a top speed of 64.8 km/h and mounted sixteen and a half tons of Ferro-Fibrous armor to protect itself from enemy fire. To dissipate the massive waste heat produced in its various configurations, it carries different amount of double heat sinks. Additionally, though not truly fixed equipment on the chassis, the Warhawk managed to incorporate an advanced Targeting Computer into each of its configurations, making all of its direct fire weapons extremely accurate. The Prime variant is well suited to long ranged combat or support role. Four CERPPC can provide owerwhelming firepower but the pilot must rely on chainfire to get the most out of this asset. In fact, an alpha-strike executed on a hot map can even lead to the Masakari Prime melting its own reactor down, destroying itself. The singular CLRM10 can reach up to 1000m and thus is a good support for primary armament of this asset without creating much heat issues. 13 DHS struggle to keep the design cool but provide good efficiency while unit is not forced to enter close combat and generate more heat from maneuvers. EOptics assist with making the most of every volley. Do you ever need to remove dezgra without risking them splattering on your beautiful Clantech? This is the Omnimech for you, then! In the event that a trashborn does get close to you, you have a battery of 2x large and 2x mediums lasers to turn them to slag. 2x ATM3(ER) missile racks and 1x HAG30 aided by EOptics, 3 tons of spare ammo you can stay in the fight for a long time without resupplying. GECM, BAP along with this units load-out turns you into walking Death Machine. Trial of Possession for a Masakari A today! This Warhawk's loadout is geared more towards long-range precision EOptics fire compared to the Prime. 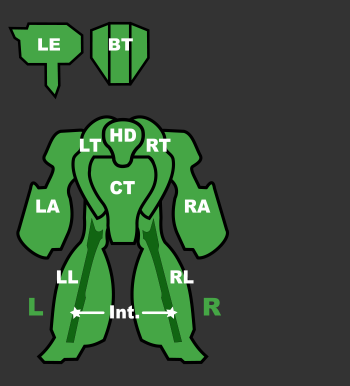 With four CERLBLs, two in each arm, the B can rapidly cripple light and even medium Mechs with great accuracy. However, it is the B's battery of ATM launchers that make it a proper threat to heavier units - the ATM9 is loaded with extended-range ammo and is well-suited to supporting the lasers. The dual ATM6 launchers use standard munitions, granting more damage at closer ranges when targets close to within 700m. Unfortunately, the B's 12 DHSes will have trouble keeping up with the heat load when stressed by the lasers. This variant also has no room for additional ammo, although even when dry, this Warhawk can easily continue dishing out the pain. At a distance, it can be easy to mistake the Warhawk C for any of its sister variants and move in to put pressure on it. Inside 400m, the C will gladly punish anyone inattentive enough to not notice the CLBX20 with 1 Free tons and six CHML setup, with two ATM3 launchers carrying HE rounds. A single well-placed alpha strike (dealing around 6100 damage without the ATMs) will eviscerate every light Mech in the game and most mediums, while forcing heavier Mechs to scramble for cover in the face of the C's talons. GECM lets the C lay low on the battlefield and surprise anything that wanders into its short reach; outside of the magic 400m boundary, the Warhawk C is completely helpless. In addition, its 9 DHSes cannot cope with the heat produced by the laser battery, so group-fire is a must. The Masakari D is swaps out the PPCs of the Prime for a quartet of CLPLs. This changes the role of the D from a long range sniper to a medium-to-long range fire-support platform, dealing high DPS if left uncontested. 17 DHS can easily manage the heat generated by the pulse lasers, and one can even cool off while still stagger-firing them. The CLRM10 is almost redundant, but provides target acquisition support through the silhouette created by the lock-on, even if you don't fire it much. This Masakari shines in engagements where it can force opponents to suffer long periods of time at the edge of its pulse laser's range while minimizing their ability to return fire. EOptics allows you to survey the battlefield and selectively locating your victim. A cooler-running alternative to the Warhawk C, it carries four CMPLs and a series of dual CSSRM racks 2x4 and 1x6. Six tons of additional space allow the E to carry more ammo than it will likely ever use, SIX Free tons to be exact. While the C carries a nasty pinpoint scalpel, the E is more of a sledgehammer, using EOptics to sneak into position and just to bulldoze anything within 450m! While an odd choice for a Clan mech, the F excels at it's job of mid to long range area denial. Six, count them, six LRM5s might not sound like much, but careful pilots will note that this allows for a salvo of five missiles every three quarters of a second. Good for keeping lighter assets running, or pounding weak Spheroid pilots with constant cockpit shake, the LRMS are backed up by a precision set of four CERMBL for focusing down components damaged by the barrage. A CNARC can be used to direct in other friendly missiles; anyone in the Star bringing Arrows will be delighted that their foes' LAMS are overburdened by the hail of LRMS. All this backed up with EOptics, LAMS for missile protection and supported by 8 DHS. This unit is also equipped with extra ton of armor and Angel ECM which helps in protecting your unit but makes you a glowing target. 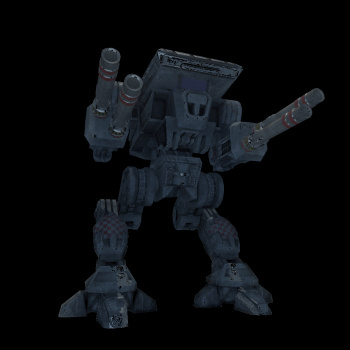 The Warhawk (codenamed Masakari by IS forces) is a Clan Assault Mech released with the Final Beta 0.7.0 release. Introduced by Clan Smoke Jaguar in 2999 in preparation for the anticipated return to the Inner Sphere, while the Dragoon Compromise stalled such plans, the Jaguars unleashed the powerful Warhawk on their Warden opponents to deadly effect. Deployed extensively in the Jaguar frontline forces, and often seen paired with the Dire Wolf, the design truly came to prominence as originally intended, on the battlefields of the Jaguars' Invasion Corridor and earned the code name of Masakari - a Japanese battle-axe used on medieval Terra - from warriors within the DCMS who faced it. Produced exclusively on the Clan Homeworlds, the design was one of many lost to the Inner Sphere Clans after contact with the Homeworlds ceased during the Jihad. This page was last edited on 13 March 2019, at 21:28.